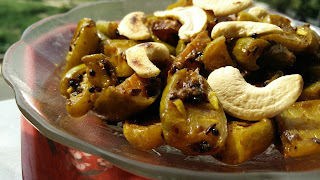 Kundru or Ivy Gourd is an Indian vegetable generally used prepared as a side dish with other main course recipes. It is not very difficult to make and also very healthy. Kundru is known to be very effective in reducing blood sugar levels. Marinate the Kundru with saltm red chilly powder, turmeric powder and dry mango powder for 15-20 mins. In heated oil in a Kadai, sauté potatoes and take it out from Kadai. Splutter cumin seeds, mustard seeds, curry leaves for few min. Add kundru and cook the vegetable for 10 min. Serve hot and garnish with cashewnuts.